A large succulent perennial plant with a strong fibrous root and a large stem supporting a rosette of fleshy, narrow, lanceolate leaves, green on both sides, bearing spiny teeth on the margins, and growing 1 to 2 feet long. The yellow to purplish drooping flowers grow in a long raceme at the top of the flower stalk, growing up to 4-1/2 feet high. The fruit is a triangular capsule containing numerous seeds. It is native to East and South Africa and cultivated in the West Indies and other tropical areas throughout the world. Although there are over 200 species of aloe there are probably only three or four with medicinal properties. Of these, Aloe Vera barbadensis is the most potent. Keep in sandy soil that is well drained. Potted plants need filtered sun or full shade. The name was derived from Arabic meaning “bitter” because of the bitter liquid found in the leaves. In 1500 B.C. Egyptians recorded use of the herbal plant in treating burns, infections and parasites. Egyptian Queens Cleopatra and Nefertiti both gave tribute to aloe vera as one of their most important beauty secrets. 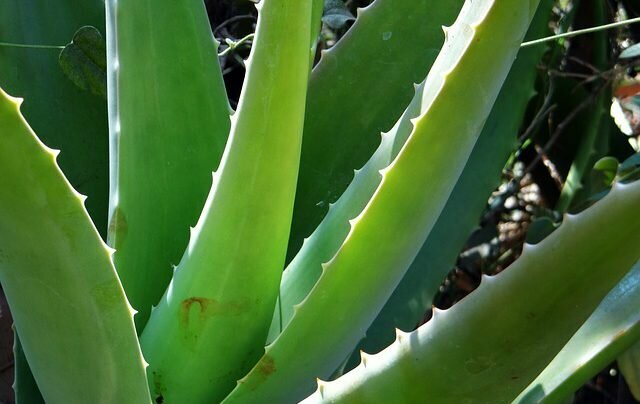 Alexander the Great carried the aloe vera plant into battle to treat wounded soldiers. The plant dates back 6,000 years, and has been in use for all that time. Ancient Greeks, Arabs and Spaniards have used the plant throughout the millennia. African hunters still rub the gel on their bodies to reduce perspiration and their scent. Hydroxyanthracene derivatives of the anthrone type (principally barbaloin); 7-hydroxyaloin isomers, aloe-emodin, chrysophanol and their glycosides; chromone derivatives (aloesin and its derivatives aloeresins A and C, and the aglycone aloesone. glucomannan (a polysaccharide), steroids, organic acids, enzymes, antibiotic principles, amino acids, saponins, minerals. Anti-inflammatory, anesthetic, antiseptic, emmenagogue (uterine stimulant), emollient, purgative, vulnerary. It is very wise to keep this plant in the kitchen. When the leaf is broken, its gel is placed on burns to relieve pain and prevent blisters. Aloe may reduce inflammation, decrease swelling and redness, and accelerate wound healing. Aloe can aid in keeping the skin supple, and has been used in the control of acne and eczema. It can relieve itching due to insect bites and allergies. It is also good for sunburn and skin irritation. Aloe's healing power comes from increasing the availability of oxygen to the skin, and by increasing the synthesis and strength of tissue. Aloe Vera contains many ingredients, including vitamins, minerals; seven of the eight essential amino acids, sugars – including the important muco-poly saccharides which act on the immune system as well as helping to detoxify the body -and essential fatty acids. Aloe Vera also contains Lignin which gives it its penetrative ability to reach deep into the skin; saponins which exert a powerful anti microbial effect against bacteria, viruses, fungi and yeasts such as candida and anthraquinones, including aloin and emodin, which are strong painkillers and antibacterial, they are also powerful laxatives. Aloe contains at least three anti-inflammatory fatty acids that are helpful for the stomach, small intestine and colon. It naturally alkalizes digestive juices to prevent over acidity – a common cause of indigestion. It helps cleanse the digestive tract by exerting a soothing, balancing effect. Over dosage can cause gastritis, diarrhea and nephritis. As aloe stimulates uterine contractions, it should be avoided during pregnancy. Also, because it is excreted in breast milk, it should be avoided during lactation as it may be purgative to the child. Aloes should be taken for a maximum of 8-10 days. Salve: Remove the thin outer skin and process the leaves in a blender, add 500 units of vitamin C powder to each cup and store in refrigerator. Tincture: [1:10, 50% alcohol] 15 to 60 drops. Dried Juice: Aloe vera juice containing the equivalent of 360 – 900 mg of dried sap is recommended by most herbalists per day. For Burns, Scalds, and Insect Bites: Break off a piece of the leaf and apply the juice directly to skin.